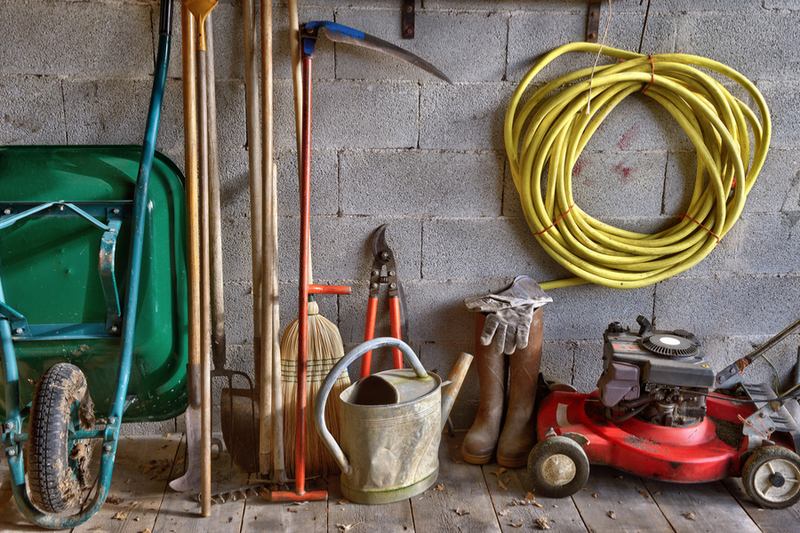 Winter is just around the corner, and that means it’s time to start preparing garden equipment and tools for winter storage! There is nothing more important to a gardener than the tools they use. Whether it be a favorite shovel, a trusted old tractor, or anything in between, it takes working equipment to get things accomplished in the garden! And winter can be hard on tools and garden equipment! Especially if they are not cleaned and stored properly. Here are some top tips on preparing garden equipment for the cold days ahead! Before you put away your shovels, rakes and other garden tools, now is the time to give them a thorough scrubbing. Use a stiff brush and a little soapy water to clean off this past spring and summers dirt and grime. Not only does it make your tools look better, it helps them last longer too. Dirt and grime left on tools can lead to rust and decay, and over time, it can take its toll on wood handles and metal blades. Keeping tools clean and well oiled can keep them from breaking. Once clean, wipe all exposed metal areas with a light coating of vegetable oil. The thin coating of oil will keep moisture and rust from forming. Store tools for the winter in a dry area. Hanging them up is your best option, as it keeps tools from picking up excess moisture. It also keeps storage areas like barns, sheds and garages neat and clean. Now is the time to sharpen the blades on all of your cutting tools. This includes shears, clippers, pruners, and even shovels and hoes. A sharp crisp edge will get your tools ready to take on all of the spring chores that await in a few months. When finished, once again apply a thing coat of vegetable oil to the metal surfaces of your cutting tools to keep them protected throughout the winter. This is also the time to oil the joints and hinged areas of all cutting tools. Use a good 3-in-1 oil or WD 40 to keep these areas free and loose. When it comes to preparing garden equipment for winter, don’t forget your power equipment! Before putting away tractors, string trimmers, and mowers, be sure to clean and prepare them for winter as well. Change the oil in mowers and tractors now so they are ready to go come spring. How you take care of power equipment before winter can be a big help to making sure they start and run successfully next spring. Change the oil in all gas-powered equipment before storing. Let the engines run for 15 minute to heat up any sludge before draining. If allowed to sit all winter, that sludge can be hard on engines next spring. And before storing, take time to grease all joints. Doing this now protects the most vulnerable parts of equipment from allowing rust to form over the winter. Last but not least, don’t allow the fuel remaining the chance to gum up over the winter months. Either protect the gas inside with a fuel stabilizer. You can allow the engines to run dry after the last use. mention a whole lot less expensive. As you store your summer use tools, make sure that you take a bit of time to get winter tools ready too! If you live in an area where snow or ice storms are possible, make sure to have what you need to deal with it ready to go. Place snow shovels and snow blowers in easy access locations, making them easy to get to when you need them. Generators can be a wonderful thing if mother nature decides to take power out for a few days in the midst of a winter storm. But not if they aren’t ready to run! Take time now to fire them up and make sure they will start and run smooth. Keep fresh gas on hand, and make sure oil levels are where they need to be. Become A This Is My Garden Member – It’s 100% Free! June 23, 2018 TIMG Comments Off on A Blue Ribbon Winning Fresh Salsa Recipe – Straight From The Garden!